On January 27, Acting Consul General Wang Yong met with Wisconsin Lt. 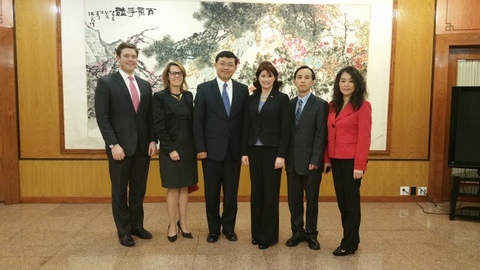 Governor Rebecca Kleefisch, who visited <?xml:namespace prefix = "st1" ns = "urn:schemas-microsoft-com:office:smarttags" />China last December, at the Consulate General. The two sides exchanged in-depth views on further promoting friendly exchanges and cooperation in various fields between China and Wisconsin. Deputy Consul General Liu Jun, Consul for Commercial Affairs Ms. Shu Luomei and Vice President of International Business Development of Wisconsin Economic Development Corporation Katy Sinnott were present at the meeting.